HUECU offers free home buying workshops in various locations. Learn more about it here. Don’t start the loan application process until you’re confident that your credit score is in good health. 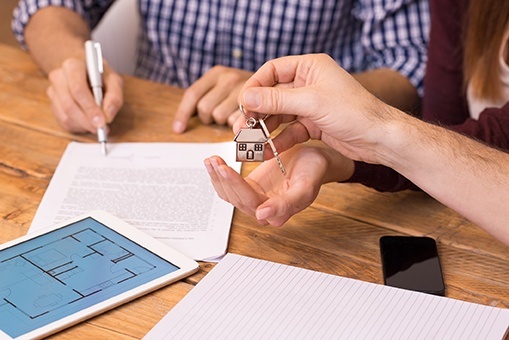 Even if you’ve bought a home and been approved for a mortgage before, you still need to be freshly pre-approved in order to buy a new house; assuming you’re not coming into your new property with a portable mortgage. Lending criteria can change, and you may be carrying more or less debt now than you did during your first loan application process. With a good credit score – aim for 660 or above – you can receive a better interest rate which means lower monthly payments and potentially significant savings in the long run. If your score isn’t in tip-top shape, help get it there by paying your bills on time and paying off credit card balances, before you start applying for home loans. When shopping for a mortgage, you need to decide whether you want a fixed rate mortgage, or an adjustable rate mortgage – and you definitely need to understand the difference between the two. A fixed rate mortgage is ideal for a home buyer who is expecting to stay in the property for as long as the loan will last. With a fixed rate, you can expect your principal and interest payments to stay the same from month to month. An adjustable rate mortgage, on the other hand, keeps your interest rate locked in for a particular period of time, before readjusting it based on market conditions. The advantage of an adjustable rate mortgage is lower mortgage payments during the initial term of the mortgage – however, if you’re a making a long-term home investment and want the security of knowing your interest rate will remain stable during the entire life of the mortgage, choose a fixed rate mortgage instead. You can learn more about HUECU mortgage options here. Don’t start shopping for your new home until you’ve been pre-approved for a mortgage by a qualified lender. This is especially true if you’re living in a competitive real estate market where, once you’ve seen a home you like, you’ll want to make an offer as soon as possible. However, without mortgage pre-approval, the process of making an offer is complicated and time-intensive. Many real estate agents won’t even look at an offer from a potential buyer who is not pre-approved. Show sellers that you’re serious by applying for pre-approval before you start shopping for your new home. Working together with a lender, you can assess your credit score, decide how much money you’re ready to put into a down payment, and work out a house-buying budget from there. Then, with mortgage pre-approval, you’re ready to get the new home search underway. Before you hit the streets, sit down and make a list of everything you want from your new home, and another list of everything you need. A physical list of needs and wants can guide you through a long day of house-hunting; keeping you focused on which home features can be compromised on, and which are not up for debate. At the same time, while it’s important to create some hard limits to keep your search on track, be flexible when considering what you truly need from a new home. Remember that some features – such as granite countertops, open-plan design or a wood-burning fireplace – can be built or replaced. Other features, like location, are harder or even impossible to change. Keep your expectations realistic, and don’t start your search without a firm plan. Every home is an investment, so even though you’re just at the beginning of the home buying journey, it’s still a good idea to consider the future resale value of any new home. Research potential neighborhoods carefully, and pay close attention to trends and developments could either enhance the property’s value (a new public transportation link, a new commercial development) or lower it (falling quality of nearby schools, rising crime rates). Thinking about the future also means remembering that the long-term cost of owning a home is made up of more than just your monthly mortgage payments. Take a close look at property taxes, homeowner association fees, and any rental ordinances that might prevent you from having a tenant in the future. An experienced realtor can also offer advice on the local market and prospects in whatever neighborhood interests you. Only after researching all of this information can you truly understand the long-term cost of a potential new home. Buying a home doesn’t have to be a difficult process, but it should be a careful and thorough one. Avoid these five mistakes, and you’ll enjoy a few less roadblocks on your exciting journey to owning a new home.